This was the project for the 2014 American Patchwork & Quilting Quilt Along. It was a hugely popular quilt along, and every time I saw a finished quilt I said to myself, "I need to make that quilt". I loved every one I spotted, each different, but each amazing. Unfortunately I did not squeeze this project into my 2014 finished list, I have higher hopes for this year's quilt along. Information and pattern instructions for the 2015 APQ Quilt Along will be arriving in your mailbox or at your newsstand very soon. To add to the fun, this year you have 3 patterns to chose from, each designed by a different quilter but all using a the same theme, 4 patches. Top left is Buried Treasure by April Rosenthal, top right is Rainbow Rows by Lissa Alexander, and bottom left is Scraptacular by Edyta Sitar. I'm hoping to make a version of all three, but first up for me is Rainbow Rows. Once I decided on my pattern I then needed to decide on my fabric. 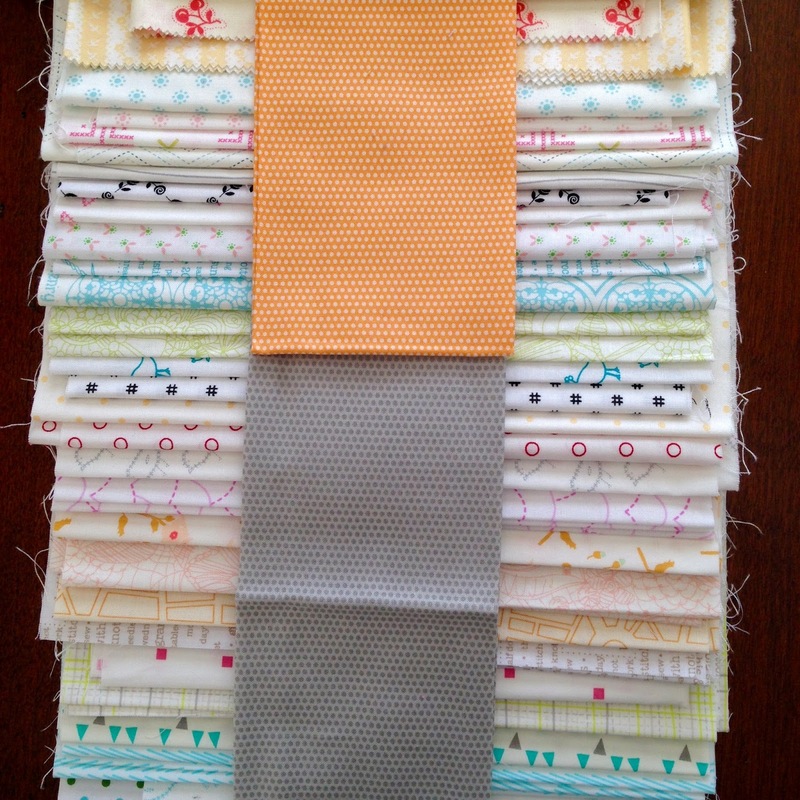 or how about rows of gray and orange, a combination of my first two options? This is what I went with. I have all the pieces cut, now it's time for some piecing. If the magazine and my blog posts don't get you motivated, then check out all these other quilters who will also be providing inspiration for these projects. 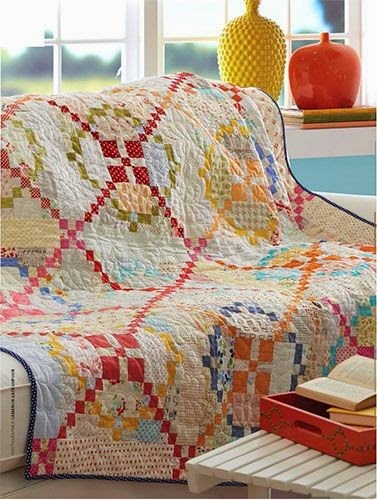 Bonnie Hunter, Quiltville’s Quips & Snips! Please join in, and if you don't have a blog I would be happy to share your progress, feel free to send me your pictures. And finally, if you use Instagram follow along using #apqquiltalong. Winter is my best sewing season, if you've looking for a project to use up some of your stash and perk up your winter days I think your search is over! Wonderful fabric choices!! I'd love to join in and make Edyta's version but I've GOT to finish up some of these UFO's around here first. I'm also in the midst of my 2 oldest boys' weddings so we have plenty of other stuff going on. I better save this one for later! Susan, waiting is not a bad thing, you will get all sorts of inspiration and ideas while you watch other quilters work on their projects. I also like Edyta's pattern and am mulling some ideas around for that one while I work on Lissa's pattern. Just make sure you get the magazine while it's available. Good Luck with those weddings! 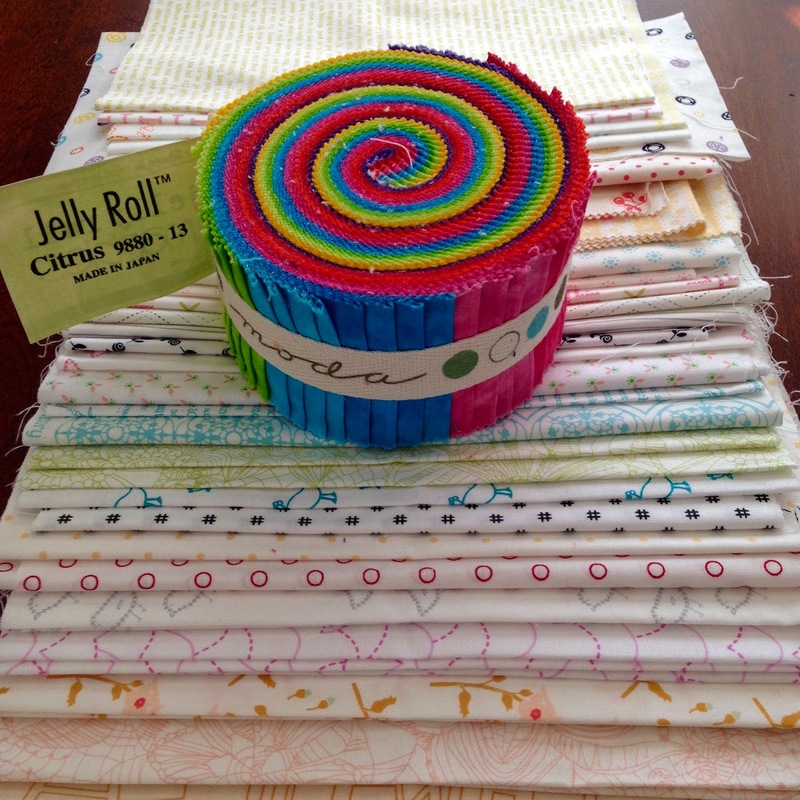 I really like the quilt you've chosen to make and can't wait to see it come together with your fabrics! Its gonna be gorgeous and I love those backgrounds. They seem hard to find around here. Take care. What size are the four patch strips in Edyta's version? Would love to start cutting and there are no magazines in sight in our area yet. They always seem to get here late. Ugh. I soo want to take a good look at the options, but my magazine has not arrived yet!!! I think I've never gone so often to my post box since I moved into my house. I go every day to check when I usually go twice a week. LOL!!! Last sew along i fell in love with Lisa Bongean's version with the dark colors. I still have it on my to do list... I'm looking forward to seeing if this one will be added to the list as well. 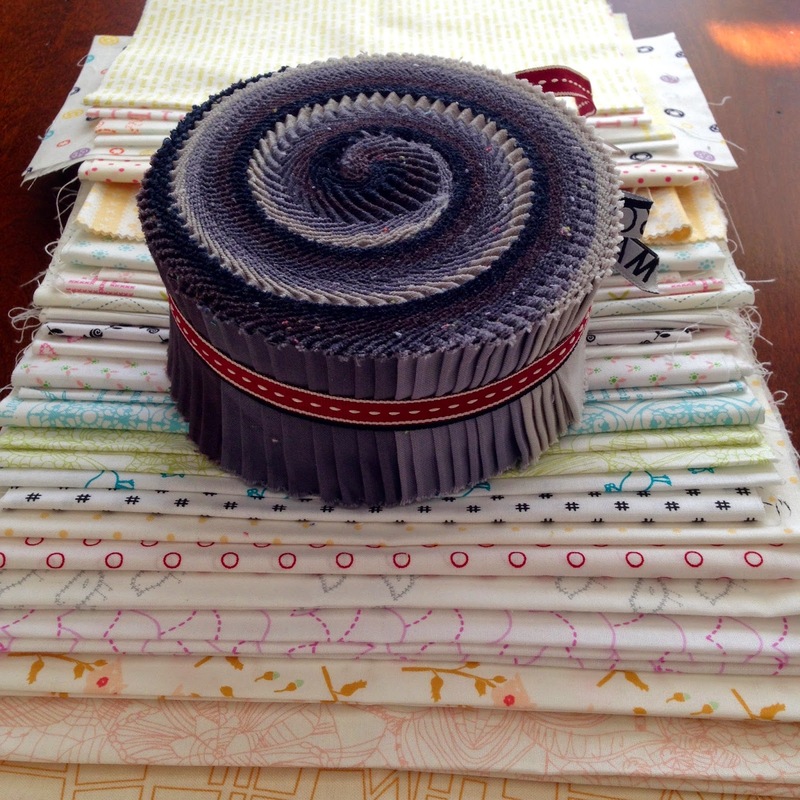 Oh my, I love the fabrics you have rounded up Thelma! I too am glad you chose the orange and gray - it will be a wonderful contrast. They will make a beautiful Rainbow Rows! I love your fabric choices and I was just trying to decide which one to start with. My magazine just arrived in today's mail! Can't wait to get started!